LOCUS has just released its list of finalists for this year's Locus Awards. I am pleased and proud that ROGUES, last year's big crossgenre anthology from Gardner Dozois and yours truly, earned a nomination for Best Original Anthology. 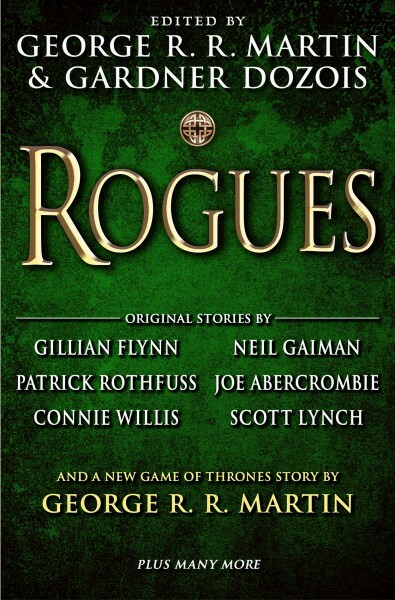 In addition, three of the stories in the ROGUES have also been nominated in their respective categories: "The Lightning Tree" by Patrick Rothfuss in Novella, and Joe Abercrombie's "Tough Times All Over" and Scott Lynch's "A Year and a Day in old Theradane" in Novelette. While this year, admittedly, may be different due to the influence of the slate campaigns, over most of the past couple of decades the Locus Poll has traditionally had significantly more participants than the Hugo nomination process. Looking over the Locus list, one cannot help but think that this is probably what the Hugo ballot would have looked like, if the Puppies had not decided to game the system this year. Is it a better list or a worse one? Opinions may differ. The proof is in the reading. In any case, congratulations to Scott, Patrick, and Joe, and thanks to everyone who nominated their stories, and ROGUES. We're glad you liked the book. Gardner and I loved doing it. Congratulations on your nomination. I'm normally without personal bias in this category, but my spouse's anthology, Long Hidden, Speculative Fiction From The Margins Of History, was nominated as well. I'm curious, have you read it? If so, what's your opinion? Sorry, I am not familiar with it. For those who would like a peep at the contents of this anthology, please see the entry in the Internet Speculative Fiction Database at: http://www.isfdb.org/cgi-bin/pl.cgi?449513 .